Zuoz Bridge in eastern Switzerland is the first of Robert Maillart’s many reinforced concrete three-hinge hollow box arch bridges. It marks a divergence in bridge engineering design philosophy away from massive constructions using traditional materials. The Zuoz Bridge remains in use, though a larger road bridge has been constructed nearby. In early 1899, work began on straightening the course of the Inn River at Zuoz. The new bridge was to be built over the re-aligned river bed. It was intended by the authorities to be a steel truss bridge, and in summer 1900, the canton’s district engineer E. Ganzoni designed one for the site. However, at the request of Achilles Schucan (1844-1927) — director of the Rhätische Bahn (Rhaetian Railway) under construction nearby — engineers Frôté & Westermann proposed a reinforced concrete alternative. It was devised by their chief designer Robert Maillart (1872-1940), and was estimated to cost 30,000 Swiss Francs. On 18th September 1900, Schucan informed Frôté & Westermann that they had won the contract, though at the reduced price of 26,200 Swiss Francs following changes to construction of the wing walls. Schucan also noted that the design was subject to approval by the railway's consultant Wilhelm Ritter (1847-1906), Maillart’s mentor and erstwhile undergraduate tutor. 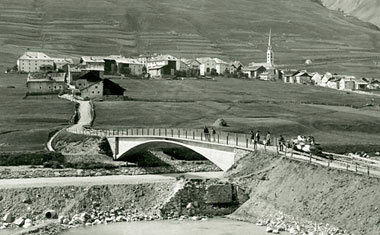 Maillart refined the form of his 1899 Stauffacher Bridge in Zurich, replacing its stone façades and mass concrete cross-walls with longitudinal walls of reinforced concrete. In the Zuoz design, the curved three-hinge arch and flat roadway deck are connected to the longitudinal edge walls and a central rib, forming a double-celled hollow box girder of varying depth. The bridge is about 40m long and 4m wide overall, with a single 30m span. The central hinge is some 3m above the hinges at the abutments. The edges of the deck cantilever from the top of spandrels, a design detail that is characteristic of Maillart’s bridges, and of many modern ones. The deck slab is 200mm thick and the arch varies in thickness from 180mm in the centre to 500mm at the abutments, which are of stone. Nothing like this bridge had been designed before and there was no accepted method of verifying the concept by mathematical calculation. Analysing the distribution of stresses over the box girder’s cross section was all but impossible, especially between the quarter spans and the abutments. Abutment and foundation construction began in autumn 1900, before Ritter had completed his assessment, but was suspended in November for the winter. Ritter laboured over checking the design and eventually gave his approval without changes, on 13th May 1901. The official contract for its construction was signed in July, by which time work was well under way. The bridge was completed in early autumn. In October 1901, Ritter carried out a full-scale load test over three days, with Maillart in attendance, to ensure the bridge’s reliability. Vertical movements were measured when the bridge was unloaded (self weight), and under traffic loading, simulated by layers of gravel placed over the roadway and by trucks. The results revealed only small deflections, though there was minor cracking around the hinge at the crown of the arch. Maillart subsequently made modifications to the structure. Ritter’s report on the load test endorsed the design, saying, "The bridge, being an innovation, will doubtless find many imitators". He concluded, "that the resulting defects are insignificant brings honour to the builder … Zuoz has gained through the new bridge a commodious, reliable, and relatively maintenance-free facility". In 1903, Maillart returned to Zuoz to advise the authorities on the contraction cracking that had developed to one side of the bridge on the longitudinal walls near the abutments. Fortunately, the structural effectiveness of the bridge had not been compromised by the defects. In 1968-9, remedial work was undertaken — possibly the bridge’s first major repairs since construction. Approximately 200mm hard macadam road surfacing was removed, and the deck slab was demolished to allow inspection and making-good of the interior of the twin hollow boxes beneath. A new reinforced concrete deck slab was cast and the bridge fascias and soffit protected with a layer of gunite. Finally, each of the abutments was stabilised with four 15m long 50-tonne ground anchors. In 1987, the roadway was resurfaced with 70mm of asphalt.